It’s been a very active year for one of Britain’s leading crime writers, Peter James and a very busy bloke. Over a festive lunch, Mike Stotter and I reflected over what 2014 has held in store for readers of James’ dark tales. Firstly, as the demand for Peter James work from his readers is intense, he finally agreed to re-release his long since out of print Espionage Drama DEAD LETTER DROP at the start of the year. Max Flynn, undercover agent, has the unenviable job of spying on his own side. When to kill, who to kill, whether to kill are all questions which have to be answered at great speed if he wants to stay alive. But why does an innocuous airline ticket No. 14B matter so much? Who has gone to the trouble of committing suicide? And could Flynn's beautiful companion be a spy? The hazy, murky world of counter espionage leaves no room for errors of judgement and Flynn knows he’s finished if he makes one false move. "In an interview recently, I was asked the question, which day was the most exciting day of my life. I had to think quite hard, as there were a few contenders. The day I first learned that my Roy Grace novel, Dead Like You, had gone to No. 1 in the Sunday Times bestseller list, was a big contender. This year, when I achieved another dream, to drive my 1965 BMW in the Goodwood Revival St Mary’s Trophy motor race – and finished 10thoverall – was another massive moment. But there was one clear winner, and that was the day in May 1980, when I received an excited phone call from my then literary agent, Jon Thurley, telling me that my first novel Dead Letter Drop, had been accepted for publication! And not only that, they were offering me a two-book deal! The advance was a princely £2,000 – OK, not a fortune, even in those days, but it didn’t matter. I was about to become a published author." Also at the start of the year the stage adaptation of his bestselling novella, The Perfect Murder embarked on a UK-wide tour of the country's leading theatres. 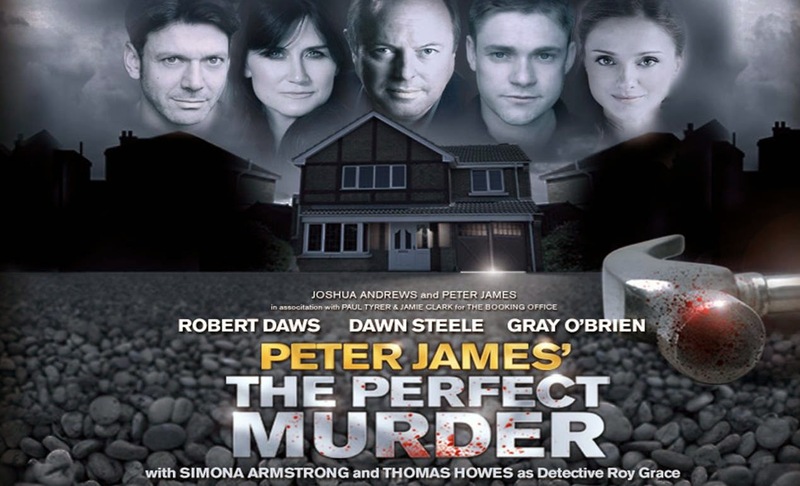 With an all-star cast led by Robert Daws (star of ITV’s The Royal, Roger Roger, Outside Edge and West End productions of The Secret of Sherlock Holmes and Public Property), Dawn Steele (star of ITV’s Wild at Heart, Sea of Souls and Monarch of the Glen and theatre productions of Verdict, Blackbird and Volcano in the West End), Gray O’Brien, (star of Coronation Street, Casualty and Peak Practice and Sleuth in the West End), Thomas Howes who played the much loved character of William the footman in Downton Abbey and whose theatre credits include the National Theatre production of The History Boys and Simona Armstrong, finalist in the BBC’s search for a‘Maria’. Victor Smiley and his wife Joan have been married for a long time. But their marriage has reached crisis point and Victor has decided there is only one way to get Joan out of his life forever... but he’s about to get a nasty surprise... As a young Detective Roy Grace starts to investigate his very first homicide case, dark forces intervene and Grace begins to fear that nothing is quite as it seems. Then Peter James released his tenth Roy Grace thriller in June WANT YOU DEAD which not surprisingly shot up the book charts. Wayne Brooks, Peter’s Editor at Pan Macmillan, says: "Peter James is at the peak of his writing career and Want You Dead, is his most shocking and thrilling book to date. I couldn’t think of a better novel to celebrate ten years of Roy Grace with." And thirdly - Peter James is not a writer constrained by the walls of genre, as his Roald Dahl-esque collection of sinister little tales A TWIST OF THE KNIFE has just been released. We’d suggest you have a glass of scotch handy when you crack the spine of these tales from the dark imagination of one of Britain’s biggest selling writers of crime and horror fiction. You will need that scotch, as these stories have a dark heart. With each twist of the knife, a chilling new journey begins ...From a woman intent on bizarre revenge, to a restaurant critic with a morbid fear of the number thirteen; and from a man arranging a life-changing assignation, to a couple heading for a disaster-filled vacation ... In multi-million-copy bestselling author Peter James' collection of short stories we first come to meet Brighton's finest detective, Roy Grace, and read the tale that went on to inspire James' hugely successful novel, Dead Simple. James exposes the Achilles heel of each of his characters, and makes us question how well we can trust ourselves, and one another. Each tale carries a twist that will haunt readers for days after they turn the final page ...Combining every twisted tale from the ebook bestsellers Short Shockers One and Short Shockers Two, with a never-seen-before collection of new material, A Twist of the Knife shows Peter James as the undisputed grand master of storytellers with this sometimes funny, often haunting, but always shocking collection. Many years ago, as Peter James was establishing his Roy Grace thrillers he asked Writer / Reviewers Mark Timlin, Barry Forshaw, Carla McKay and I for some lunch. We had such a great time, this lead to Peter organising what has now become an annual tradition, The Peter James Festive Lunch. Here’s the report from our first lunch via The Rap Sheet that introduced Roy Grace of Brighton PD to the reading public. All correct entries will be entered into a prize draw and the first correct answer picked at random on 4 / 1 / 2015 will be declared the winner of the book.